It has been a long time since the Sabres were in a position to sell off a number of assets in the name of rebuilding the roster. As the saying goes “if Gretzky can be traded, anyone can be traded”, and that rings particularly true for the Sabres. There is truthfully no safe player at any level of the Sabres organization as the team appears to have a serious identity issue. While the Sabres certainly can come at the deadline with more than just a seller’s mentality, there is likely going to be more heading out the door than coming back in. When I look at the Sabres I see a team with some impressive top-end talent, and abundance of “middle-six” players and impressive depth along the blueline. Buffalo’s greatest strength is in the goal crease and with talented, young forwards. What they lack is a proper identity amongst their four NHL lines as a relative hodgepodge of players has made up the 23-man roster with no discernible identity on any of the lines. Robyn Regehr is one of the potential trade targets who could be shipped at the deadline. There are basically three categories that Darcy Regier is going to group his players into by April 3; For Sale; Available; Untouchable. Players that are “For Sale” typically include your rental players and anyone who may have requested a trade. “Available” players are just that, players who aren’t being shopped but are still available for the right price. Lastly, you have the “Untouchable” category which was previously a well-populated list which has likely dwindled to almost nothing. Sure the Sabres have some assets that they’re not likely to part with, but there probably isn’t any more than one or two names who are considered untouchable.The key to remember here is that the Sabres aren’t in need of a proper rebuild in which they attempt to acquire mounds of draft picks. They’re in need of a retooling that will help forge a new identity and reshape specific portions of the roster. This isn’t a long term effort so much as a project that will probably truly begin bearing fruit in two or three seasons. So anyone worth keeping around will need to be capable of being a consistent contributor over the next 3-5 seasons.But who fits where? Since this is the shortest list, it seems like the best place to start. I place each of those three players on this list because I see them as the only three worthy of keeping and building around. Now, Grigorenko and Girgensons haven’t proven to be the type of generational talent that a team can be assembled around. But they are 2012 first round selections that can’t be parted with at this point. Perhaps a year or two down the road when their worth to the team is determined, but they hold too much potential value for the Sabres (specifically Darcy Regier) to part ways with at this point. Vanek makes the list over anyone else – namely Ryan Miller – because he has proven that he was not only worth the money back in 2007, but he is capable of being a leader on the team. He isn’t a gritty leader cast from the mold of Chris Drury, but he’s the most skilled player on the roster and still has enough miles to be worth keeping around over the timetable that I assume the Sabres will be looking at. This is an easy list to compile as well. With Regehr, Leopold, Pardy, Sulzer and Hecht as pending UFAs, they could be acquired as rentals by a team looking for help on the stretch run. Stafford, who is rumored to be looking for a trade, would be considered to be for sale if he has indeed requested a trade out of Buffalo. Leopold has served as a rental before and should garner attention on April 3. Pardy and Sulzer are both spare parts who are unlikely to command much than a late-round pick or accompany another player as a deal sweetener. As standalone trade targets, however, they aren’t much help to the Sabres. The same goes for Hecht as he won’t offer much independently to a team other than a third or fourth line role player who may fill PK time. Regehr and Leopold obviously have more impressive resumes and will address the needs of teams searching for rental help along the blueline. The Fourth Period pointed to the Red Wings, Kings and Blues being amongst the teams who could be searching for this type of help come deadline day. Regier would be wise to leverage as much as he can get for both Regehr and Leopold at the deadline as neither seems to be in the plans moving forward and they have both been average contributors so far this season. Neither will garner more than a mid-round pick for the Sabres at this point, but a pair of picks falling between the third and fifth rounds can serve the Sabres a hell of a lot better than nothing. Look for those two to be wearing a different sweater by the end of April and for the Sabres to have received fourth round picks in exchange for each, at the very least. Truthfully the entire roster (aside from the three players listed as untouchable) is up for grabs. Even Vanek, Grigorenko and Girgensons could be shipped for the right price. The five names above are players who I feel would garner significant respect on the open market from most GMs. The key with this group is that it is comprised of players who would likely be used in trades in which each team is receiving value. Like the Hodgson trade in which each team addressed a significant need while sacrificing an important prospect, each of these players could be used in a similar fashion. Yes, each player serves a very important role for the Sabres. But they could each also bring the organization a new face that can address one of the many shortcomings that have become evident in 2013. Miller and Pominville top this list simply because I think each could use a new home. Miller, despite playing very impressive hockey this year, seems exasperated with the often passionless effort his teammates provide for him. He is certainly an upper-echelon goalie and will be that type of player in the early stages of his new contract. However, I don’t know if the Sabres would be wise to tether themselves to a goaltender over 30 years old for a contract that will be at least four years long. That is likely what Miller will be asking for next summer and that is why he should be considered as a potential target. While his value is nowhere near the max it reached in 2009-10, he would certainly be attractive to a number of teams. There is no tailor-made suitor desperately seeking a goalie, but Miller has miles left on his tires and could serve well for a team hoping that a cornerstone in net is their missing piece. While Miller may not command all that much on his own, he would certainly make an interesting package if paired with a high pick or impressive player. Without venturing down the unrealistic, XBOX blockbuster route, the most return for a trade involving Miller would need to be one that included at least one other asset from the Sabres organization. Alone Miller wouldn’t bring all that much return, in a larger package he could be the side dish that tips the scale in Buffalo’s favor. I include Pominville and Ennis simply because they’re still incredibly skilled forwards who would be an asset to a number of organizations. Ennis’ trade value is particularly high and the young center can swing out to wing and has a number of years before hitting unrestricted free agency. Funny enough, he may have the most value on the entire roster. Pominville, while toting a significant cap hit, would be a valuable secondary scoring asset to a competitor. Teams like the Kings, Canucks and Red Wings who have been said to be searching for scoring help would certainly love a two-way winger like Pominville who can fill a number of roles. 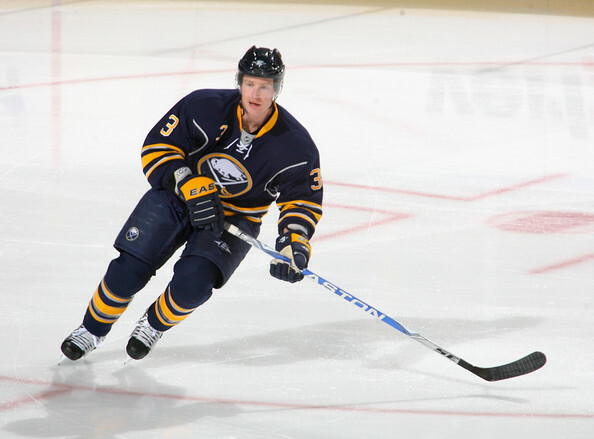 His value, much like Ennis’, would be significantly higher than most other players on the Sabres roster. Where I see his shortcomings are my perceptions of the locker room. It would appear the Sabres are a disjointed bunch and the issues stem from the leadership. Perhaps moving players like Miller and Pominville (entrenched veteran leaders in the room) would serve as a wake-up call for those who would remain. Myers and Sekera are each listed for a slightly different reason. Myers because his play has tailed off so significantly that I wouldn’t be surprised to see him thrive with a change of scenery. Sekera because he has been playing so well that he would likely carry a significant amount of value on the trade market. Myers’ salary and cap hit make him nearly unmovable particularly when you consider the play he is providing at that price. However, he is still a promising young player who will likely thrive in the proper situation. He has shown flashes this season but they haven’t come at anywhere near a consistent pace. Sekera has been steady and accountable on the backend this season. His offensive game hasn’t been too noticeable, but he has the ability to be a solid second-pair player for a number of teams. I’d compare his potential value to that of Ennis; both are promising players with NHL experience who can provide short and long-term value to any team that acquires them. Assigning value to most of these players is next to impossible. Paul Gaustad went for a first round pick last season after Nashville identified how badly they needed him. It also helped that Gaustad had a great run of games leading to the deadline. Players like Miller, Pominville and Ennis are all extremely talented and valuable, but finding a suitor who can offer a player of equal value in return will be a difficult prospect. The one thing you can count on is Darcy Regier targeting a player you didn’t necessarily expect to see acquired in a trade that will give the Sabres full value in terms of addressing their needs. Nice article- The problem I see is that I do not have any faith in Darcy bring in the right player(s) for those available players. If the Sabres are to really move forward, they need a new person molding this team.